Summer is a time of fruition and fulfillment. 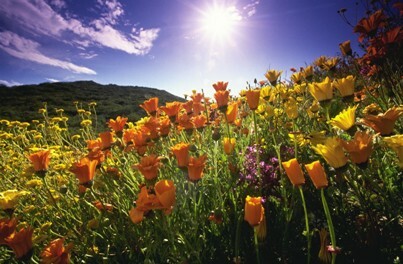 Nature and the world outside is in full bloom, lush with trees and flowers in a myriad of colors. The days have turned longer and the weather is hot and sunny. Seeds planted in the spring are bearing fruit, coming into their full maturity and manifestation. The first harvests of fresh fruits and vegetables are being picked and enjoyed. Summer is a time of ripening when colors are at their most vibrant, the fragrances of flowers are at their most potent, and the summer heat is at its most intense. The Summer Solstice and the celebration of Lughnasadh are the two summer celebrations that occur on the wheel of the year. The summer solstice is considered to be the 1st day of summer and the longest day of the year. The solstice actually begins the night before, on Midsummer’s Eve. A solstice refers to the time when the sun reaches its highest point. The word “solstice” means “sun standing still”, and refers to the point at which the sun’s visual trajectory north or south across the horizon comes to a halt. It occurs when the earth’s axis tilts directly towards or away from the sun. The Summer Solstice celebrates the abundance of the earth. It is a time when the energies of nature reach their highest point, when everything is ripe, flourishing, and has reached its fullest potential. It is a time of intensity, passion, and overflowing abundance. In Neopaganism mythology, it is traditionally the time when the God and Goddess are married. The Summer Solstice is often celebrated with the lighting of bonfires, and with feasting and dancing. It is also associated with the picking of medicinal plants and herbs for their healing properties. Roses and other flowers are used for decoration. Blueberries, strawberries, raspberries, and fresh berry pies are made and enjoyed, along with other fresh fruits and vegetables of the season. Honey cakes, dandelion tea, and mead made from honey are also part of the celebrations. Lughnasadh (pro. lu-nah–sah) is an Old Irish word referring to the commemoration of the God Lugh. It is a holiday that marks the beginning of the harvest cycle, particularly the harvesting of grains such as wheat and barley, corn and rye. It is also a time to observe the passing and waning of summer, and the preparation for autumn when the nights grow longer, the days shorter, and the weather colder. The theme of Lughnasadh is that of endings and the twilight years of old age. It represents preparation for the inevitability of death, and the acceptance of the ever-turning wheel of life. In the Neopagan tradition, Lughnasadh celebrates the time when the sun god ages and declines, gradually losing his strength. The Goddess watches in sorrow and joy, knowing that he is dying yet aware that he will live again as the wheel turns into another season.